Congratulations! My book is now in its second printing!! 2019!! 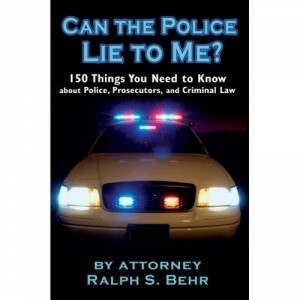 The book contains definitions of the 50 most often charged crimes and answers to the 100 most asked criminal law questions. It gives practical and readable definitions of 50 crimes from: arson to witness tampering, plus answers to the 100 questions most often asked of lawyers from those either involved in a criminal investigation or arrested. The book is written by an experienced criminal lawyer with over 30 years experience in courtrooms from New York to Florida and the U.S. Supreme Court, in a clear, understandable language. Get a copy of the book on Amazon, or come to our office. Get the information you need. Know your rights. Published first in 2008 by BookMasters, my book is the book you need to own, I know because I wrote it for you, not for me or my vanity (?). CAN THE POLICE LIE TO ME? is 218 pages of pure information on criminal law, prosecutors and police. The book has one paragraph definitions of the fifty most-charged crimes in Florida: from A to Z. Distilled into plain English it is direct, concise and easy to read. The book then goes into a question and answer format. I have assembled the 100 questions I hear from my clients. It starts with the realization that “CAN THE POICE LIE TO ME?” And the answer is YES. Each question is one sentence and each answer is limited to one page. This is a great first step for students, teachers and citizens to know enough about criminal law to get along in this world. If you read the book and have a question just call me. I’ll answer your questions; whether about criminal law in Florida or if you have been arrested and need to know how to defend yourself. Availaable from Amazon or from me in my office (I usually provide copies for my clients to read).